It's always been a mystery to me why so many shop signs and café menus have glaring typos and spelling mistakes. 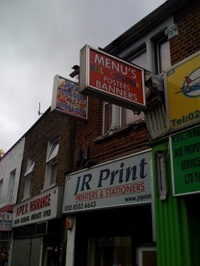 Surely the core job requirement for a printer or signmakers is basic grammer and owning a dictionary? (See, I don't even expect them to be able to spell, owning a dictionary would be good enough). Well, here in Walthamstow I've discovered what I suspect is the source of at least some of these howlers. Would you buy a sign from this company...? It purports to be from BT offering me a deal on a wireless Home Hub and a rebate cheque - but it has all of the hallmarks of a phishing email. However, after much digging in the email's Raw Source and just a gut feeling, I think the email is real. 1. If the email is a phishing email, it's worryingly good and likely effective. 2. If the email is genuine, then someone at BT's marketing department should be fired for sending out this incompetent and reckless email. I searched for "phishing" on BT's web site to find out who to forward the email to for verification - there were no results. Are BT ignorant of this problem? Even my useless bank have such a service. I've emailed a general enquiry to BT. I'll let you know the result.